Published by the Intergovernmental Panel on Climate Change (IPCC), the Special Report on 1.5°C of Global Warming is dignified to be a game-changer for climate action worldwide and providing policymakers, businesses, and climate advocates a timeline and clear targets to reduce greenhouse gas emissions and prevent the worsening of the impacts of climate change, including serious-floods, typhoons, droughts, and sea level rise…and so on. The impacts of such temperature increase would highly impact the disadvantaged and vulnerable sectors through food and water shortages, higher prices of commodities, income losses, poorer health conditions, and population displacements. The drastic changes in natural ecosystems could lead to irreversible losses of resources that would affect even big businesses in the long run. 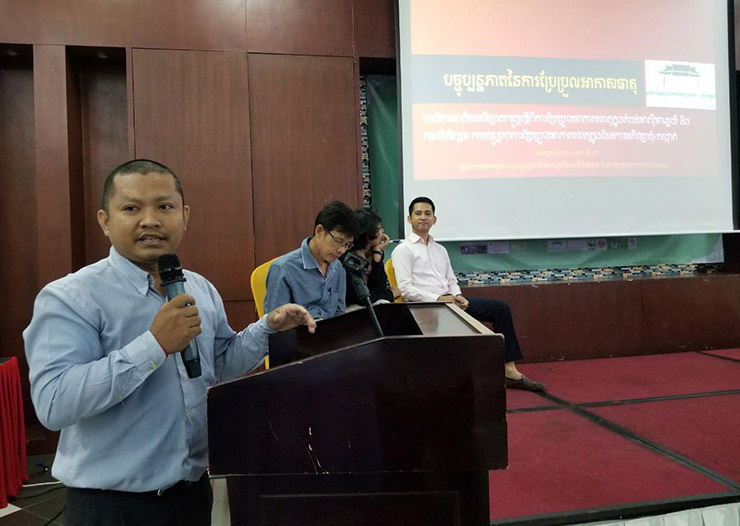 On November 27, 2018; Mr. Sey Peou, a NECA Network Coordinator described the this IPCC SR1.5, Climate Change Scenario and Responses of climate change in the context of the landscape management to 133 participants in Civil Society Forum joint-organized by NGOF, NTFP-EP, CEPA, RECOFTC, WWF, FLOW, MY Village as well as local communities from province of Preah Vihear, Kampong Thom, Kratie, Stung Treng and Ratanakiri Provinces under funds supported by IUCN and Swiss Agency for Development and Cooperation (SDC). As expected from this forum which are: 1) all participants discuss on priority issues affecting on landscapes and discuss on natural resource management 2) Identify strategies, position papers and recommendations to respond on proposed issues which particularly landscape management; and 3). Improve collaboration among participants to enable them to work together and to address on impact of development projects in the landscape. The presentation is strong highlighting the the IPCC Special Reports that wish to shift to renewable energy that may result in co-benefits towards sustainability which friendly achieving good health (SDG 3), cleaner energy (SDG 7), more responsible production and consumption (SDG 12), and healthier oceans (SDG 14). Accelerating energy efficiency, which also reduces further greenhouse gas emissions, would result in additional synergies with more sustainable industries (SDG 9) and cities and communities (SDG 11), along with stronger partnerships among different sectors (SDG 17). 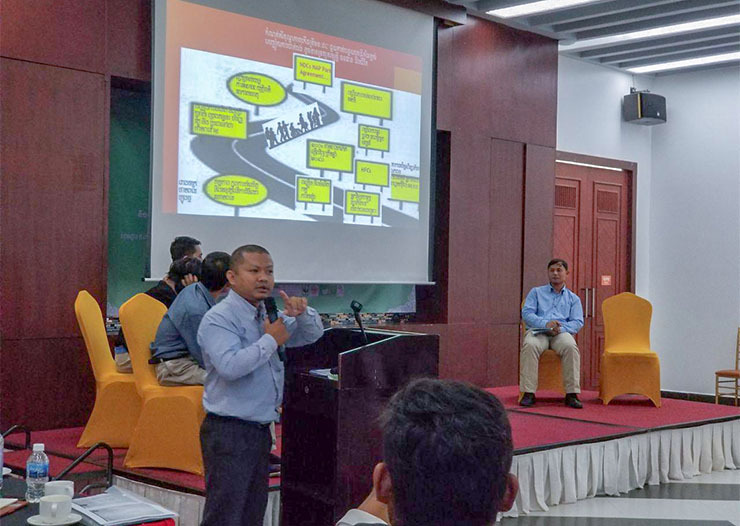 As a vulnerable country to climate change impacts; Cambodia needs to adapt to a 1.5 degree warmer world through more sustainable economic practices, most notably in agriculture, forestry, and fishing sectors, and strengthen the capacity of local communities to deal with both sudden and slow-onset impacts of climate change. Adaptation practices would specifically lead to lower poverty (SDG 1) and hunger rates (SDG 2), good health (SDG 3), cleaner waters (SDG 6), equality among various sectors (SDGs 5 and 10), and stronger institutions promoting peace and justice (SDG 16). We are still feasible to achieve both the 1.5-degree limitation and the SDGs, many challenges remain. There is no single exact blueprint for attaining both goals. Multiple accounts of project implementation related to climate action show that the actual integration between mitigation, adaptation, and sustainable development is difficult as it requires reconciling trade-offs across spatial and sectoral levels. The preventing a more drastic warming, it would save billions of lives from unjustly living in extremely poor conditions and open more opportunities to alleviate, if not eradicate poverty. It is certainly more beneficial for nations to spend more now on mitigation and adaptation measures to prevent more long-term losses in finances and natural resources, which are both needed for sustainable development. With only two to three decades left to limit global warming to 1.5°C. Addressing climate change and sustainable development both require long-term planning and an inclusive, collaborative approach involving all stakeholders. They both also require an unprecedented shift in lifestyles, behaviors, and attitudes, from top to bottom.